Our 5th anniversary came and went like nothing happened…oh wait, except I guess have a baby 4 days earlier is technically something! I’ve given Michael several pieces of art to celebrate our relationship: wedding, 1st anniversary, and now 5th anniversary. I was planning to just pass him his newborn daughter when she had a poopy diaper and say, “Happy Anniversary Baby, I love you!” but I decided to create a large canvas for our home instead to mark the occasion. See…I’m such a loving wife. Where on earth would the man be without me? 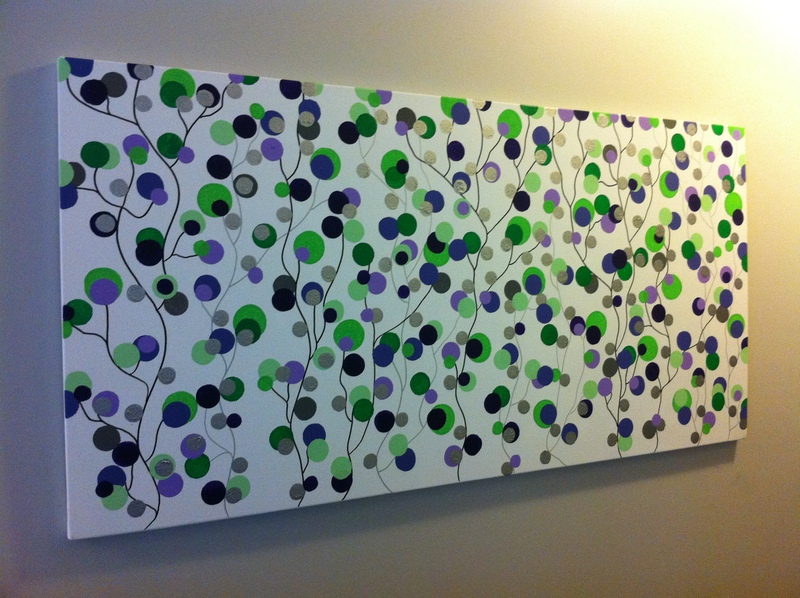 This canvas gets a lot of praise in our hallway: colours are greens, purples, and silver. It really brightens up an otherwise dark passageway. Original idea came from Two Girls Being Crafty.